Here are some all-natural ways to gain freedom from sinus suffering. • Clear your sinuses and your mind with a steamy stovetop spa. Add a few drops of wintergreen oil to a pot of boiling water and inhale the steam. Take care not to be burned by the vapor. • Herbs and spices like ginger, scallion, basil, garlic, oregano, cayenne peppers, white pepper, horseradish and turmeric will have your sinus passageways unblocked in no time! • The supplement bromelain - a papaya and pineapple-based enzyme - helps reduce histamine release, the body's natural allergic response. • Clear your nasal passageway daily for healthy, happy sinuses. Add 1 tsp of sea salt, 1 drop of oregano oil, and 1 drop of wintergreen to a cup of warm water. Fill a small-spouted squeeze bottle with this warm solution. Squirt into one nostril at a time and blow out through the nose. Alternate nostrils. • Press one clove of garlic, mix with 1 tsp of olive oil and soak a clean cotton ball with the oil mixture and place in nostrils after having washed the nostril with warm salt water. Leave in for 20 minutes and repeat three times a day until the symptoms clear up. • These two simple self-massage practices that follow are incredibly effective for relieving sinus congestion. For both, sit at the tip of a sturdy chair with your back erect, spine stretched, and your head tilted slightly forward. 1. Inhale and gently press your forehead just inside the temples with your palms. Exhale and release. warming your fingers first if they're cold. Avoid the foods that produce mucous and dampness: dairy products, cold and raw foods, corn (including corn syrup), and simple sugars. Choose whole grains like quinoa, amaranth and brown rice instead of wheat, rye and barley, which are typically high allergy grains. Opt for papaya, cranberries, pear, pineapple, cherries, mango, and citrus fruits. Eat more green vegetables such as artichoke, Brussels sprouts, broccoli, kale, cauliflower, and spinach. Both alcohol and smoking should be avoided during a sinus flare-up as they irritate the respiratory tract and worsen nasal inflammation. Also, sinus congestion is often worse with lack of quality rest so be sure to get plenty of sleep and keep your stress level low. Do you have the winter blues? Are you bloated or do you suffer with swelling feet and legs, or ballooned eye lids, which are the classic signs of water retention? Hawthorn and Uva-Ursi are powerful botanicals for water retention and help the fluid balance. Hawthorn is in Hanna Kroeger’s Circuflow and excellent product for the heart, circulation. Dr. Christopher has Hawthorn berry syrup. Edema is an observable swelling from fluid accumulation in certain body tissues. The swelling is the result of the accumulation of excess fluid under the skin in the spaces within the tissues that are outside of the blood vessels. Vitamin B6, Silicon and Hawthorn all act as diuretics which help to reduce excessive fluid in the body. Other helpful botanicals are Corn Silk, Uva-Ursi, Alfafa and Kelp. (Dr Christopher's Jurassic green.) NOW Foods has a new product called "Water Out". B vitamins and amino acids that are commonly deficient in people with Edema. Both Vitamin C and Bioflavonoid Mix may help to control edema and fluid balance. Potassium replenishes potassium lost in diuresis. Vitamin E is well-known as being important for the health of the circulatory system. Alfalfa has been used as a detoxifier for the body. Kelp is a natural source for essential nutrients such as minerals and B vitamins. Ready for Spring ... a good cleanse? Dr. Christopher and Hanna Kroeger have Nourishing, Healing cleanses already in kits. You save more money this way. It was once thought that stingers should be scraped out with a credit card, finger nail, or any such device. Research has shown that the best course of action is to pull the stinger out as soon as possible with your fingers or tweezers. The remaining venom in the sac of the stinger DOES NOT increase the reaction should you inadvertently push more venom into your wound. We do not know and cannot predict allergic reactions, specifically anaphylactic reactions. Follow the ABC’s, Airway, Breathing, and Circulation, which must be adhered to in that order when watching for reactions. The first step is to pull the stinger out if possible. (Many times you can see it as it isn't very deep and sometimes it stays with the bee or wasp. If a severe allergic reaction occurs, you must transport immediately and resort to basic life support. Diphenhydramne (Benadryl) can be given to decrease minimal allergic reactions. Of the above remedies, ice looks to be the most effective. Those who turn to their physicians instead for relief from bee stings will likely be prescribed oral antihistamines and/or topical (cream or ointment) cortisteroid preparations. The Jewelweed plant has been used for centuries in North America by Native Americans and Herbalists, as a natural preventative and treatment for poison ivy and poison oak; and is a folk remedy for many other skin disorders . There is almost always a jewelweed plant growing close by poison ivy, poison oak and nettle plants. Isn't Heavenly Father great!! He gives the antidote close by. It often grows on the edge of creek beds. It should not be cultivated as it is very invasive. Jewelweed will take over areas and crowd out other important wild herbs. Pictures to help identify Jewelweed. For years, a lot of articles with regards to the causes of breast cancer point to an unhealthy diet and lack of exercise or your choice of perspiration as the major links to this disease which happens to be the biggest killer among women during these last two decades. These studies would have been most credible if it were not for the fact that several women including Linda McCartney who have been religious vegetarians and exercise- freaks have also been unfortunate in suffering breast cancer. In the 'Bra and Breast Cancer Study' in the United States, It was discovered that women with breast cancer had a history of sporting tighter and longer bra-wearing than did the women who had not (yet) developed the disease. In fact, virtually the entire cancer group wore bras over 12 hours. When a woman wears a tight bra, she subjects her breasts to pressure, closing off the lymphatic pathway from the breast to the nodes. This causes fluid built-up swelling, tenderness and cyst formation. Toxins must be flushed out via the lymphatic, however, a bra-constricted breast cannot adequately perform this cleansing process, resulting in toxin accumulation in the breast. Truthfully, bras are creating droopy, weak breasts......the breast relies on the bras for artificial support; the body loses its ability to support the breast by itself.. This is why many women feel uncomfortable without the bra. Also jogging which makes everything in the body drop. What cuts down on your chance of getting breast cancer? DON'T WEAR A TIGHT BRA! Also sleep without them. It is true that bras do not cause breast per se, but ill-fitting, too tight bras can help cancer growth since they can prevent your body from excreting dangerous cancer-causing chemicals. There is a remarkable success rate for recovery from fibrocystic breast disease within 10 days to two weeks of going bra-free. Also many women have tried going bra-less and recorded a miraculous improvement in their health! For more information - click on these links. This kit is designed for home and travel. Infection Formula - Natural infection fighter: reduces inflammation, kills infection, clear toxins from lymph system. Lower Bowel - Colon cleanse and rebuilding. Cayenne - Helps stop bleeding, stimulates heart, (strokes, heart attacks). Echinacea Alcohol Extract - Helps promote healthy immune system function. Lobelia Alcohol Extract - Liver disorders, produces vomiting. Super Garlic Extract - For colds, flu, & to build the immune system. X-Ceptic Extract - For all types of infection. Oil of Garlic - Natural antibiotic, asthma, earaches. Cayenne Heat Ointment - .25 oz. - Gives relief of sore and tense muscles and joints. Sting and Bites Ointment (Plantain) - 2 oz. - Used to help draw out toxins and poisons. New and Exciting Essential oils. Steve Febrichiev, classic, natural perfumer. In the past few years, interest in Aromatherapy has increased so that what was considered to be something which members of counter-culture groups or so called, a few "health nuts" in the past had considered a new medical discipline is now advertised on national television and in main-line magazines. What is the truth? Does Aromatherapy have any value, or is it just another crazy fad? Let's examine the facts and the fiction surrounding it. Fact #1: Our olfactory sense, or sense of smell is the strongest of all our senses. Further, it is the only sense that does not cross over in the brain. For instance, images perceived by our right eye are processed on the left hemisphere of our brain. It is the same with the sense of touch, hearing, and taste. And even further, the signal is passed to our "old" or reptilian brain. This is the portion of our brains over which we have no control. It is like a computer that runs our body, heart-beat, blood pressure, digestive and elimination processes and numerous other bodily functions. Fact #2: Since the mid 1980's the improvement of the sensitivity of our scientific testing equipment has been greatly increased by computer enhancement. This has led to the discovery of literally hundreds of micro-bio-chemicals which even in microscopic quantities effect our metabolism and the function, or malfunction of our bodies. What was thought to be a disorder of the thought process is now proven to be a chemical imbalance. Another example are the endorphin (endomorphines) released by strenuous exercise and labour during pregnancy, and are superlative pain killers. Fact #3: The inhalation of various odours, usually from essential oils, cause the release of micro-bio-chemicals. Roses for instance cause a release of the endorphins. Sampaquita causes an increase in the neuro-transmitter seratonin, the lack of, or diminishment of which is the primary cause of clinical depression. The absolute oil of the Chinese hedge Osmanthus releases a micro-bio-chemical which is at the centre of our brain and causes cravings to be satisfied. Lavender, especially when augmented with Chamomile Blue (german), and a touch of violet leaf has a most profound calming effect. Kara Karounde, a rare flower from the Congo has been shown to stimulate the developmentally disabled and children suffering from Down's Syndrome. Whether the lovely fragrance or the release of micro-bio-chemicals causes these reactions is unknown as far as my research has taken me. Fact #4: During the Victorian Era the crowned heads of Europe made use of the many aromatherapy compounds available at the time. The famous Yardly Company compounded numberous remedies for H.R.H. Queen Victoria. Franz Joseph, His Imperial Majesty, the Holy Roman Emperor swore by a longevity compound compiled by the famous Viennese firm of Mann and Winter. Both lived notably long lives. Fantasy#1: Synthetic aromachemicals and essential oils are just as effective as the natural product. Research in Germany and Switzerland have shown that synthetics have little or no effect. With the information given above, I leave you to draw your own conslusions. One thing I must mention for the safety of my readers is that many of the products sold today by the large corporations are totally synthetic. Many of which are referred to by classical perfumers as "Frankensteins" as they do not occur in nature. One wonders if exposure to such products might have a truly adverse effect on the delicate chemistry of the human body, if not immediately, over a period of time. My advice, therefore, gleaned from experience after 29 years of study and research on my part is that Aromatherapy is effective and the conclusions reached by the early researchers and those conducting studies today are valid and may well lead to a new discipline for the relief of human suffering and the propagation of good health and well-being. It is a new Australian essential oil. Like a candle carrying the light of dignity, Fragonia is fertiliser for the spirit, taking you beyond lingering hurts and emotional enmeshments stemming from any unresolved family issues. When your life force has wilted and you are feeling fragile, frail, debilitated and separate, Fragonia will move you away from your fragility and lovingly demand that you call on your self-respect and dignity when dealing with memories of the far, far past. Patterns of repetition in your consciousness can keep you trapped within the limitations of your personal history. What was in the past can uncannily show up again in the present. These patterns take the form of grooves in your emotional grid and denote patterns of energy layered with emotional scarring. Fragonia gently helps to remove those scars from the emotional framework, alleviating toxic residue and mental static. As we become personally accountable for the accumulative effects of our emotions, thoughts and attitudes, purufication practices are required to burn off layers of buried negative impressions, repressions and suppressions that come forth as old blockages are released. At the top of the spine, at the base of the skull, there is an emotional release point which acts a filter for the nervous system and spine. By applying Fragonia tho this reflex point the nervous system will relax, allowing feelings, emotions and thoughts to be processed differenty. Brisk friction massage alongside the spine with Fragonia is also an important aspect of this release, strengthening the power of the neural pathways. On a molecular level, Dr. Daniel Pénoël, well known French doctor and aromatic medicine practitioner, has described Fragonia as the Golden Triangle. The ratio of its' functional groups and the proportions between the molecules are arranged according to the golden proportion which is reproduced at several levels, like a fractal. "The golden proportion and the fractal structure is absolutely unique!" says Dr. Penoel. Preliminary testing shows that Fragonia has anti-microbial, anti-inflammatory, pain-relieving and expectorant properties. Dr. Pénoël suggests a couple of drops of Fragonia applied daily to the groin area, under the armpits, and on the side of the neck, where the lymphatic nodes are siturate, to enhance one's immune system. Fragonia is non-toxic and non-irritating and can safely be used with infants and children. Dr. Pénoël suggested at a seminar that everyone dab some on each chakra point before going to sleep at night. Dr. Penoel describes many cases of those who have been able to unblock their emotions, open their heart and allow peace to enter with the help of Fragonia. It can be uses 'neat' or diluted in a carrier oil. Developed by a Tasmania farmer, John Hood, who noticed that the steel wire fence that had this strange plant growing near it was not rusting, and decided to find out why. After years of investigation, trials, etc, the result is this amazing essential oil, with unique properties. Common Uses: Kunzea ambigua is registered with the Australian Therapeutic Goods Administration for the relief of symptoms of influenza, arthritis, rheumatism, muscular aches and pains, and to help relieve nervous tension, stress and mild anxiety. In skin care, Kunzea has been found to help serious skin conditions such as eczema and rashes. It is refreshing, clean, stimulating and invigorating. Kunzea is one of Australia’s newest oils, from Tasmania. Aromatic Scent: Kunzea has a clean balsamic scent with fresh invigorating undertones. The essential oil of Kunzea ambigua has been found effective against several bacteria, including Staphylococcus aureus, E. coli and Candida albicans. In many cases, Kunzea ambigua has helped improve severe skin conditions such as eczema, dermatitis, ulcers and chillblains. It is anti-inflammatory (makes it a great oil for treating insect bites and stings, etc,) , anti-infectious and antimicrobial (makes it into a very effective essential oil for the treatment of many types of infection, including the common cold and prevents infection from taking hold). French medical aromatic doctor, Dr Daniel Pénoël, uses kunzea in his medical practice to control inflammation, including using it internally, taken in capsules. Ask any Filipino what their national flower is and chances are he’ll know it’s the Sampaguita. Ask him to tell you something about it and he’ll probably say it’s fragrant, small and white. Can he think of anything interesting about it? Hmm ... well, we do have a female rock singer named after it! The truth is, not many of the Filipinos give this heavenly-scented blossom much thought. Yet they see it practically every day sold practically everywhere by street children. They are strung into fragrant garlands – often given as offerings on many altars, as tokens of welcome to visitors to our country, are omnipresent in our countless processions, and are often seen dangling from rear view mirrors serving as natural car fresheners. But it is a wonder that despite the fact that it’s all over the place, nobody can really say much about it! For one thing, do you know how the rest of the world calls it? Its common English name is Arabian Jasmine, while its botanical name is Jasminum sambac. Sambac is how the Western world often refers to it for short. In our country, it also goes by several aliases ranging from sampagung and kampupot, to kulatai, ponso, lumabi and malur. The Filipino national flower is called Arabian Jasmine, hails from India, has a Japanese game named after it, and that it was declared their symbol by an American, the sampaguita suddenly sounds a lot more colorful than its unassuming white petals, doesn’t it? But the surprises aren’t over yet. The sampaguita is actually considered an herb. It is said that the roots were once used to treat wounds and snake bites. The young leaves and flowers were also used to make a putty which was mixed and eaten with rice to dry scabies and other skin eruptions. The Chinese are also said to use it to flavor food, tea and wine. To this day, Arabian Jasmine is used extensively in fragrances in cosmetics. One final thing about the sampaguita: each flower actually lasts for less than a day on the plant, lasting anywhere from just 12 to 20 hours, usually reaching its peak a few hours before midnight, but each plant flowers profusely the whole year through. Top Ten immune fighting foods. Studies show that green tea — infused with the antioxidant EGCG — reduces the risk of most types of cancer. "The phytonutrients in tea also support the growth of intestinal bacteria," says Bowerman. "Specifically, they inhibit the growth of bad bacteria — E. coli, Clostridium, Salmonella — and leave the beneficial bacteria untouched." Why is this important? "Because up to 70 percent of your immune system is located in your digestive tract," says Bowerman. "Four cups a day will keep it functioning at its peak." Contrary to popular belief, ginger — a piquant addition to so many Asian dishes — isn't a root, it's a stem, which means it contains living compounds that improve your health. Chief among them is gingerol, a cancer suppressor that studies have shown to be particularly effective against that of the colon. Chop ginger or grind it fresh and add it to soy-marinated fish or chicken as often as you can. The more you can handle, the better. "This potent little fruit can help prevent a range of diseases from cancer to heart disease," says Ryan Andrews, the director of research at Precision Nutrition, in Toronto, Canada. One serving (3.5 ounces) contains more antioxidants than any other fruit. Drizzle with lemon juice and mix with strawberries for a disease-fighting supersnack. Known for making desserts sweet and Indian food complex, cinnamon is rich in antioxidants that inhibit blood clotting and bacterial growth (including the bad-breath variety). "Studies also suggest that it may help stabilize blood sugar, reducing the risk of type 2 diabetes," says dietitian Nancy Clark, author of Nancy Clark's Sports Nutrition Guidebook. "What's more, it may help reduce bad cholesterol. Try half a teaspoon a day in yogurt or oatmeal." Often confused with yams, this tuber is one of the healthiest foods on the planet. In addition to countering the effects of secondhand smoke and preventing diabetes, sweet potatoes contain glutathione, an antioxidant that can enhance nutrient metabolism and immune-system health, as well as protect against Alzheimer's, Parkinson's, liver disease, cystic fibrosis, HIV, cancer, heart attack, and stroke. "One sweet potato a day is a great alternative to the traditional variety," says Clark. "I think of tomatoes as the 'fighting herpes helper' for the divorcé crowd," says Petersen. Their lycopene content can also help protect against degenerative diseases. "Cooked tomatoes and tomato paste work best," he says. Shoot for half a tomato, or 12 to 20 ounces of tomato juice, a day. Packed with potassium, manganese, and antioxidants, this fruit also helps support proper pH levels in the body, making it more difficult for pathogens to invade, says Petersen. Plus, the fiber in figs can lower insulin and blood-sugar levels, reducing the risk of diabetes and metabolic syndrome. Select figs with dark skins (they contain more nutrients) and eat them alone or add them to trail mix. Newman's Own fig newtons are also a quick and easy way to boost the immune system. Aim for four figs per week. Delicious when added to brown rice or quinoa, these mushrooms are rich in the antioxidant ergothioneine, which protects cells from abnormal growth and replication. "In short, they reduce the risk of cancer," says Bowerman, who recommends half a cup once or twice a week. "Cooking them in red wine, which contains the antioxidant resveratrol, magnifies their immunity-boosting power." The juice from the biblical fruit of many seeds can reduce your risk of most cancers, thanks to polyphenols called ellagitannins, which give the fruit its color. In fact, a recent study at UCLA found that pomegranate juice slows the growth of prostate cancer cells by a factor of six. "Drink a cup a day," says Bowerman. Audio Cassette size so they can be easily slipped into your purse or pocket. I just have to tell you, My daughter was at the dentist 6 months ago the hygeinist said her gums were pretty bad at 3's and 4's. After Cecelia's class, I've been putting tea tree 1 drop along with what ever tooth paste I use, same with my kids, Today at the dentists the hygienist was so amazed at the difference in my daughters gum health!!! Her gums were at 1's and 2's. Apparently bacteria in the mouth causes the problems and by using just one drop of tea tree when brushing (this has been for 1 month.) it has cleared up quite a bit of her gum disease!!! We have a new Bowel Conditioner formula that my husband has been using for over 30 years and likes it better than anything else he has tried. It softens the stool while conditioning the bowel. 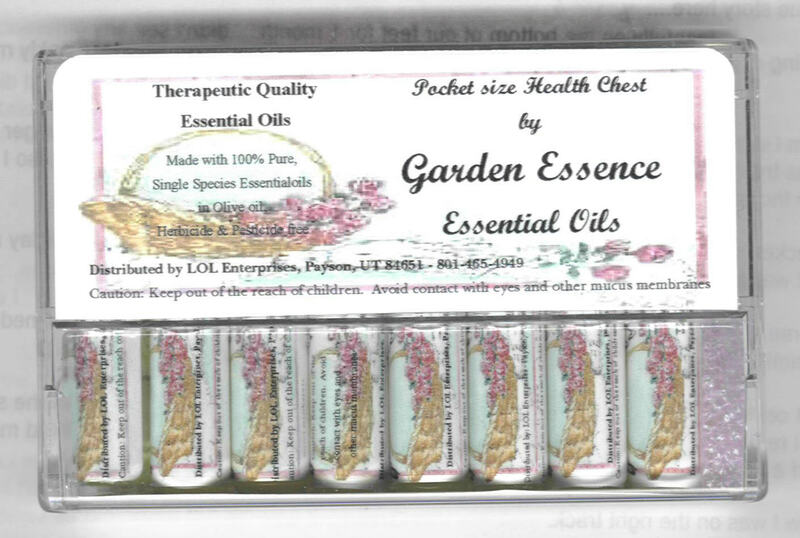 We are selling it under our Garden Essence label. We had a company bottle them for us and then we add our label. Don't forget prayer and listen to your body as you take anything. Remember that even doctors are only practicing. Disclaimer: The statements in this website have not been evaluated by the Food and Drug Administration. 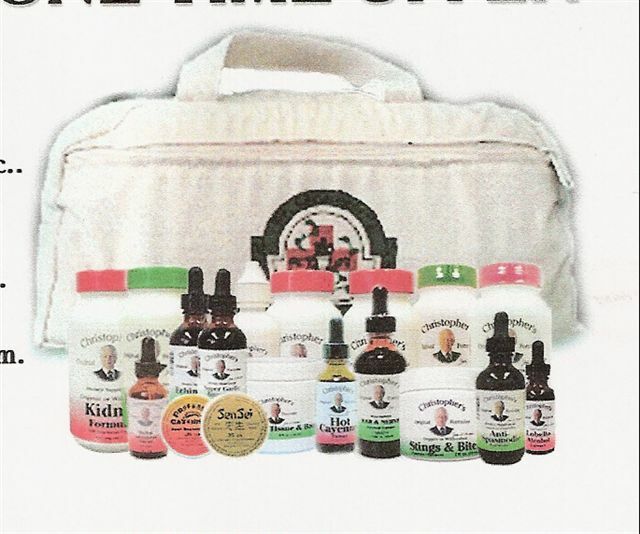 These products are not intended to diagnose, treat, cure, or prevent disease. The descriptions of nutritional combinations are based on the historical usage of the various ingredients. They are not intended to promote any direct or implied health claims, and actual results of usage can vary. We do not spam, give, sell or share our e-mail addresses with anyone. You may use these numbers to order any products or if you have any problems with the shopping cart. Deet vs. Catnip essential oil. How & where to use essential oils. click here for USPS rates + insurance.